← Ben shows off his skills! Why were so many people wearing Kimono today?? It was Coming-of-Age Day – a celebration for the “new adults”! When a person reaches the age of 20, he or she is considered to be an adult in Japan. They are eligible to vote, and drinking alcohol and smoking are permitted from this age. The second Monday of January is “Coming-of-Age Day”, or “Seijin-no-hi” which honors young people who have reached 20 years of age as new members of society. Each town and city holds a Coming-of-Age ceremony on this day and many new adults attend it. 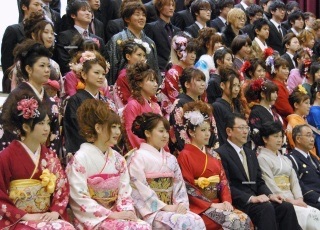 Lots of women wear colorful and gorgeous long-sleeved kimono called “furisode” and men are dressed in a suit and tie or kimono with “hakama“. They generally have the reunion with school friends after the ceremony. It’s a good opportunity to catch up with old friends and have fun!! !